The concert season at UMBC got off to an great start last night with a solo performance by violist Jessica Meyer. 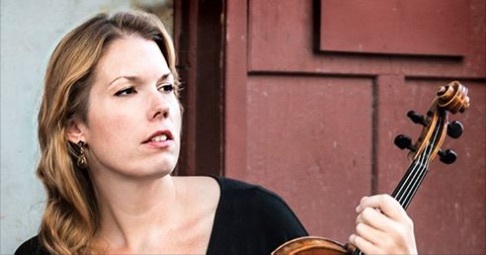 As a member of the ensemble counter)induction, Meyer is an experienced presenter of contemporary music, and it was clear from the start that she thrives on exploring the viola’s full expressive capacity, regardless of stylistic boundaries. Through the hour-long performance of her original works, Meyer showcased the expressive possibilities of amplified viola with loop pedal, transforming the instrument into larger ensembles through careful layering and repetition of a variety of timbres and playing techniques, notably pizzicato and scordatura. My favorite of the works was Afflicted Mantra, which, with its drone and gradual introduction of speech, created a mesmerizing texture and harmonic landscape. Like many of the works, I felt this could have gone on even longer, but there was something alluring about the brevity of these encounters. With each selection preceded by introductory remarks from the stage, the evening paired performance with confession. Meyer’s biographical vignettes allowed for a more immediately personal connection between the audience and the performer, which was very welcome; many classical performers could learn something from this example. Because of this comfort, I could easily have imagined the performance taking place in less formal surroundings…with dim lighting. And good drinks. Copyright © 2019 Matthew Schreibeis. All Rights Reserved.